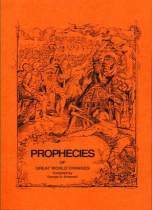 PROPHECIES OF GREAT WORLD CHANGES compiled by George B. Brownell. World-War Prophecies, Coming Changes of Great Magnitude, False Christs, The New Heaven and the New Earth, The New Order and the Old, Etc. 31 pgs. 5x8. Paperback. ISBN: 0-89540-176-2. $4.00.